So I've had my headliner replaced on my 987S twice. This time, after getting it back from the shop, I have some pretty bad wind noise coming from the driver's window. It is kind of a PITA to bring the car back to the dealer to get this tweaked. Are there any "self-help" fixes that could be applied? You first have to determine the cause of the wind noise. It seems odd that replacing the headliner would have any effect on the seal between the window and its rubber gasket at the top. Also, what was the problem with the first two headliners (the original and the first replacement)? Is the noise coming from the top of the window, or the rear vertical surface where it contacts the rubber gasket? You are right, it is very odd (and not really worth the trip back to the dealer at this point). The noise is coming from the top of the window about 2/3 of the way back. Based off of everything the car was in the shop for, this is the only "logical" thing I could deduce is a culprit. The headliner was replaced (this time) for "bunching" on the passengers side towards the rear of the cockpit. The first time it was replaced due to stitching failure in the center between the driver/passenger seats. I still don't understand how a repair to the headliner would cause the window to no longer make a tight seal across the entire top surface of the window, but, if you want to try the following adjustment, it may solve your wind noise problem. "There are four rubber plugs located on the door bottom surface. To adjust the height of where the window stops, you must first remove (pop out) the two OUTBOARD plugs. Then, reach through the holes with an E6 Torx driver and turn the screws, one at a time until you achieve the desired adjusmtent. (Note, if you don't have an E6 Torx driver, a regular [1/4 inch drive] 5mm socket will work in a pinch, and will not strip the fastener). To keep track of how much you have adjusted, mark the top of the window with masking tape or, preferably with a wax pencil, tracing the top surface of the window where it meets the seal at the top. There is a little more than 1/2 inch of adjustment through this method. 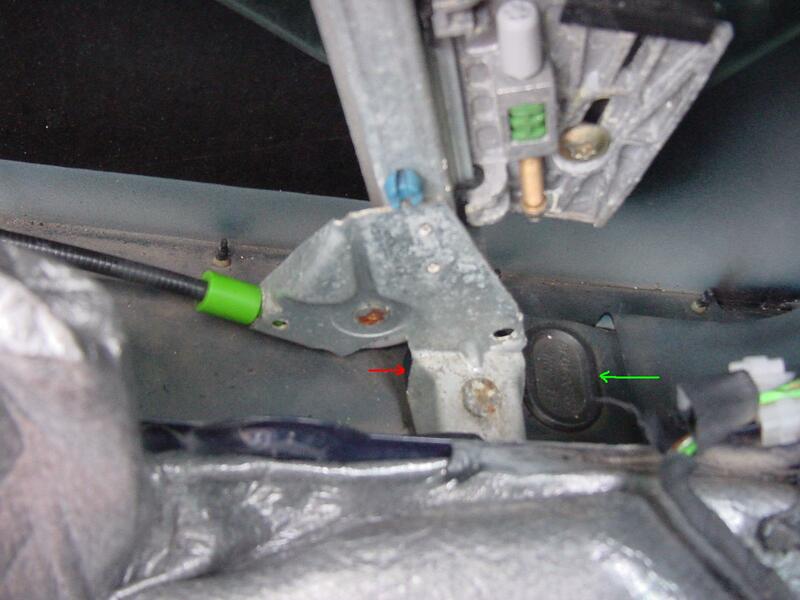 Note: The green arrow shows the outboard plug that must be removed, at the forward part of the driver's door. The red arrow shows the very edge of the inboard plug (which should only be used to adjust the inboard/outbard angle of the window by means of loosening and then shifting each leg of the window regulator). With a little patience, you should be able to minimize or eliminate the wind noise". Mbodo, In your case, you may only have to adjust the rearmost screw. IIRC, you have to turn CCW to get that side to adjust upwards, but I'm not 100% sure. Agreed, not sure how the two could be related, but as that was the only logical item I could deduce that would have any impact on the top itself, it was my best guess. I'd just rather not think that the air gap could have been caused while the car was sitting in the air for an extended period of time, getting a new transmission. Regardless, thanks for the information. I appreciate it. Pulling off the two rubber plugs and making the adjustment to the two torx screws (once you understand what the components look like inside the door) takes less than 15 minutes and doesn't involve leaving the car at the dealer. That's always a plus for me. LOL! Let us know how you resolve the issue. Check to make sure that the rubber gasket (or the felt one) have not pushed into an odd position, check that sides of the car look the same. Once after they worked on my top the gaskets were out of place and I had terrible noise.